People who can't have sugar or need to avoid it for health reasons can use sugar-free icing recipes for almost every major type of frosting. Create an indulgent dessert by making use of a sugar substitute in the icing you prepare or choosing different ingredients altogether. Buttercream is one of the easiest icings to make in a sugar-free version, especially using Swerve Sweetener Confectioners Style. This mixture of oligosaccharides and erythritol measures cup for cup like regular confectioner's sugar, and its texture is quite similar. Add flavorings or extract as needed to flavor your icing - this recipe is for a basic vanilla buttercream. 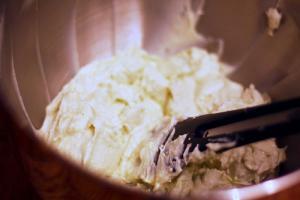 In a medium-sized bowl, cream together the butter and vanilla until it is fluffy. Cream in the Swerve and milk until well combined. Add a little more milk as needed to adjust the consistency. In place of the Swerve confectioner's style, try using a mixture of dry milk powder, corn starch, with a granulated sugar substitute, such as stevia or Splenda. An equal amount of sugar-free vanilla pudding can also stand in for granulated sugar or powdered sugar in some buttercream recipes. If the texture of your sugar-free buttercream isn't working, try troubleshooting it as you would normal buttercream. Add a little cornstarch or powdered sugar substitute if the frosting is too soft, and thin it out with milk, cream, or water if it's too stiff. Many recipes for sugar-free cream cheese icing use a no sugar pudding mix in place of granulated sugar, as this one does below. Image courtesy of Meng He, missmeng on Flickr. In the bowl of a stand mixer or in a large mixing bowl using a hand mixer, whip the cream cheese and vanilla until it is fluffy. In another bowl, beat the pudding mix and milk until it is well combined, about one minute. With the beater running, slowly add the pudding mix to the cream cheese mix until it is well combined. Refrigerate for one hour and then spread it on your cake. Traditional royal icing is simply confectioners' sugar, milk, and sometimes egg whites. It's a favorite for decorating gingerbread cookies, glazing muffins, or drizzling over especially sweet cupcakes. 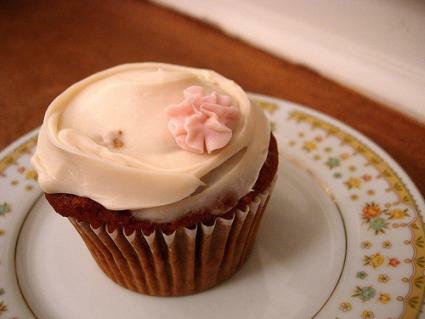 Again, the Swerve Sweetener Confectioners Style is your best bet for this type of icing. In a large bowl using a hand mixer or in a stand mixer, combine the meringue and powdered sugar until well mixed. Add the vanilla and the warm water. Beat on medium speed until the mixture is whipped, about five minutes. Pipe the icing using a pastry bag. Modify the texture of granulated sweeteners by placing them in a food processor and pulsing several times until they become fine and powdery and then using them in place of the Swerve Confectioners Style. Traditional ganache is a simple mixture of chocolate and heavy cream. The easiest way to make your ganache is to use sugar-free chocolate, heavy cream, and a low-volume sweetener, such as stevia. Put the chopped chocolate in a medium sized bowl. In a small saucepan, heat the cream and the stevia over medium heat, stirring constantly, until it just starts to simmer. Pour the cream over the chocolate pieces and stir until it is smooth. Fondant is one type of frosting that just does not come in a sugar-free variety. It uses confectioners' sugar as well as glucose syrup to enhance its taste and hold its modeling clay-like structure, and an artificial sweetener isn't likely to deliver the same results. There are a number of sugar substitutes available on the market today. Using them in place of sugar may affect the taste and texture of the icing. While Swerve is discussed at length above, here's some information about other sugar substitutes. Aspartame is also known by the brand name NutraSweet or Equal. You can purchase aspartame in many forms. While it becomes bitter if you heat it, aspartame tastes just like sugar otherwise. Equal Spoonful measures cup for cup like sugar. It will change the texture of the frosting. Processing it in the food processor helps to make it more like sugar. Also known as Splenda, sucralose heats well, and it has no bitter aftertaste at all. Splenda granulated sweetener measures cup for cup like sugar. However, when you use Splenda in icing, it does have a granular texture. Pulse it in the food processor to soften the texture. Splenda packets are sweeter than sugar. You need 12 packets to equal 1/2 cup of sugar, making this an excellent sweetener to mix with milk powder and cornstarch to adjust icing consistency. Stevia is an herbal sweetener. In large amounts, it may impart a bitter aftertaste, depending on how it was processed. One teaspoon of stevia equals one cup of sugar as far as sweetness goes. Therefore, this is a good sweetener to combine with cornstarch and milk powder to make your own "powdered sugar" blend for icing. Converting traditional recipes to sugar-free ones can be a little tricky, so it may take you a try or two to get the level of sweetness and the consistency exactly as you like it. Make small adjustments and record your measurements so you'll know exactly how to reproduce your icing once you reach perfection.